Tulsa Bone & Joint is home to a state-of-the-art, dedicated outpatient rheumatology infusion clinic. 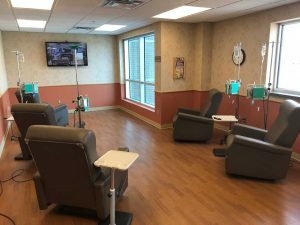 Here, rheumatology patients can receive infusion therapy for biologic agents in a comfortable environment. The Tulsa Bone & Joint rheumatology infusion clinic is located at 4812 S. 109th E. Ave. on the 2nd floor and is Tulsa’s largest, most up-to-date rheumatology infusion suite. Since services are outpatient, costs tend to be more affordable than rheumatology infusion offerings in a hospital setting. If you have questions about the rheumatology infusion clinic, please call 918-236-4567.